To help you pick the right lens, below you’ll find a rundown of the most common types of camera lenses sold in stores and what they’re typically used for. Be sure to consult this guide on photography terminology if “focal length” is a word that makes no sense to you. Just like you’d think, a wide angle lens will allow you to take in more of a given scene than a standard lens, which is quite useful when taking pictures of large landscapes or buildings. Depending on the focal length, a wide angle lens can be referred to as an Ultra Wide Lens, which has a focal length of below 24mm, generally. One can also use a wide angle lens to play with size in a photo, with subjects in the foreground appearing much larger than they normally would. Allowing you to close in on a far away subject, telephoto lenses are ideal for action-heavy scenes seen from a distance, like a sporting match. If you happen to frequent games/matches, or you have a child on a sports team, a telephoto lens would be incredibly useful to capture quality photos. Another use for telephoto lenses are portrait photos, as the lens is able to depict the main subject in a lot of detail while leaving the background blurred. Sitting in-between telephoto lenses and wide angle lenses are standard lenses, which as you might guess, are a jack-of-all-trades-but-master-of-none type lens. A good point of reference for what a standard lens can accomplish is the human eye, as it typically can capture photos similar to what a person can see. If you don’t have a very specific goal for your photography, a standard lens may be your best bet. Relatively new in the world of photography, superzoom lenses were designed to remove the need of having multiple lenses for different photo-styles, hence their rather large focal length. Able to capture landscapes as well as zoom in on far-off subjects, a superzoom is handy when you’re traveling and don’t have the space to carry multiple lenses. 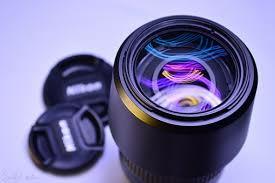 Be wary, however, as a superzoom lens generally can’t produce photos with as much detail as a specific-use lens. Do you plan on taking pictures of tiny creatures, or maybe close-ups of delicious looking food? Then a macro lens is the lens you need. With a very small depth of field, macro lenses can photograph small subjects in great detail, though they lack much versatility if you want to take other types of photos.